FL SynthMaker can be used to make synth plugins, effects and dashboards (to control external gear). There's also plenty of pre-made plugins waiting to be used. This tutorial shows how to create ring modulator and echo/delay effects. Tip: To learn SynthMaker it's a good idea to start with some simple projects that recreate something you already know well. For example, a 2 oscillator synth. What do you know about synths? So they have Oscillators - Envelopes - Filters - Output. Then all you need to do is find those modules in SynthMaker and link them together, done! Making a basic synth will be the subject of our next tutorial. FL SynthMaker was updated to version 2 with FL Studio 10.0.9. FL SynthMaker has been included FREE with FL Studio Producer Edition (and upward) since FL Studio 8. 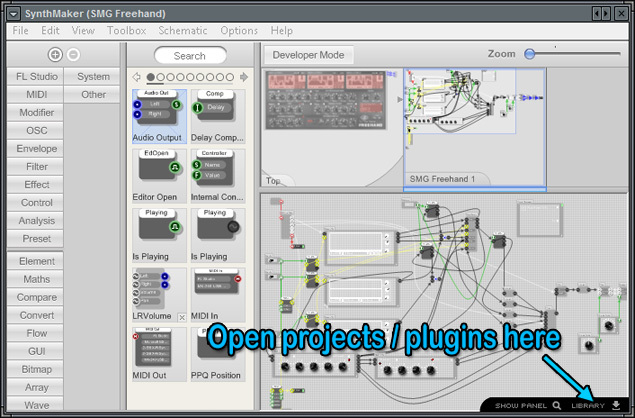 FL SynthMaker loads as an Instrument or Effect plugin and is an audio programming application that is used to create synth and effect plugins without the need to write programming code. The instruments and effects you create in SynthMaker can be used in FL Studio as 'native' plugins and shared with other FL Studio users. FL Synthmaker 2 loads all Synthmaker 2 projects from the stand-alone version. Importantly FL Synthmaker comes with many pre-made synth, effect and dashboard projects, that become plugins at the click of a button, check them out here. You can also learn more about SynthMaker 2 here. FL Studio Producer edition or higher includes an FL native version of SynthMaker. SynthMaker allows you to create your own instrument, effect and dashboard plugins. There's also a growing collection of user-made freebies, see the bottom of this news item. However you don't need to be a synthesis guru to use SynthMaker as you can download a bunch of great plugins from within SynthMaker. Just click on the 'LIBRARY' button and select from those available in the Downloader. Click the 'SHOW PANEL' to swap between the plugin interface and it's underpants. There's also a collection of Synthmaker plugins in the SynthMaker forums and of course we have a SynthMaker forum section too. There are 200! new presets for SMG Freehand!